Deviled eggs are one of America's best-loved snacks. Take a tray full of deviled eggs to a party and watch it quickly disappear. 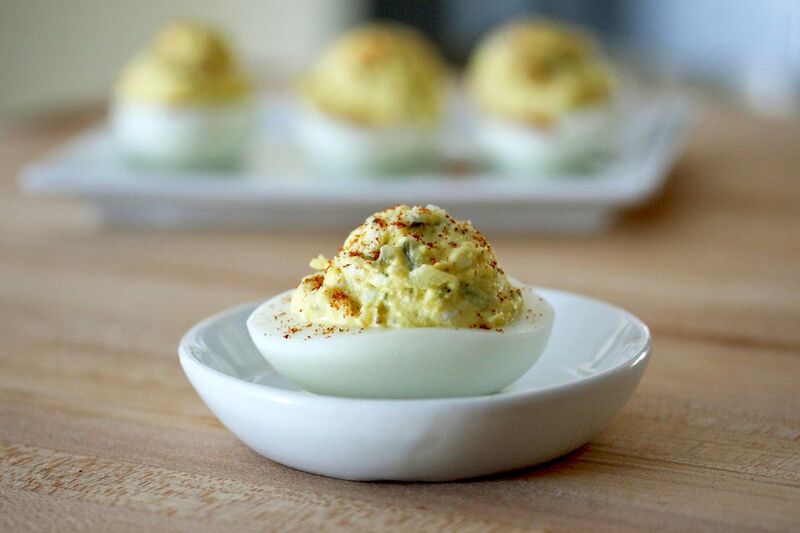 You don't need a special occasion or party to enjoy deviled eggs. Add them to a meal, make them for a weekend snack or ​game day gathering, for a spring brunch, or with a summer picnic. Even if you don't have a specialty egg platter with wells for the eggs, you can still make a special presentation. Line a large platter with kale or lettuce leaves. Arrange the filled deviled eggs among the greens. Aside from being attractive, the greens keep them from rolling and sliding. For extra color, add some large ripe olives and grape tomatoes to the platter. For the very best deviled eggs, start with eggs that are fairly close to their expiration date. If eggs are too fresh, they can be difficult to peel cleanly, and you want all of your eggs to be perfect! The secret ingredient in these Southern deviled eggs is the sweet pickle relish. Garnish the stuffed eggs with thin slices of cornichon or gherkin pickles or pimiento strips. These fun deviled egg chicks are perfect for spring and Easter celebrations. Bits of carrot and peppercorns form the eyes and beaks of the little chicks. The kids will love these! The filling for these simple, classic deviled eggs is the perfect combination of mayonnaise, seasoned salt, and a just a touch of prepared mustard. Use a Creole seasoning blend in place of the seasoned salt for a little extra zing. Garnish the eggs with paprika and some pickle or olive slices. Wow! These deviled eggs have it all! The filling of tangy mayonnaise, blue cheese, and sour cream includes crumbled bacon and roasted garlic. The slender tips of the cooked asparagus spears provide the delicious garnish, while a lovely micro salad adds a gourmet touch. These elegant deviled eggs will make an impression. Hard boiled eggs and canned tuna complement each other beautifully, so why not combine them in a deviled egg filling? Some chopped dill pickle, red onions, and celery add crunch to this flavorful filling. Slices of dill pickle make a delicious topping for the eggs or top them with sliced olives or a dab of tapenade. These delicious dilly deviled eggs contain a dill trifecta: chopped dill pickle, dried dill, and dill pickle juice. Some mayonnaise and a little mustard bring the filling together perfectly. Top these eggs with some sweet paprika or a little more dillweed. Tomato sauce adds zesty Spanish flavor to the filling in these Spanish deviled eggs, and they look particularly "devilish" with the red color of the yolk mixture. Finish them off with some chopped fresh chives and sliced cherry tomatoes. These everyday deviled eggs contain a mixture of yellow mustard, relish, and mayonnaise. Arrange the deviled eggs on a bed of kale or curly lettuce and add grape tomatoes and olives for snacking. Horseradish adds heat and flavor to these zesty deviled eggs. A dash of hot sauce and a bit of Dijon mustard add to the flavor. Top these snacks off with some chopped chives or a sprinkling of sweet or smoked paprika. These Halloween deviled eggs will be a big hit with your friends and family. The googly-eyed eggs sport a ghoulish green filling for the eyeballs with strips of pimento for the bloodshot whites. Dijon deviled eggs are always a hit, and they're super easy to prepare with a seasoned mayonnaise and Dijon mustard filling. Garnish them with sliced green onion tops and parsley or sprinkle with sweet paprika. These unique Polish stuffed eggs contain ham, cheese, sour cream, and mustard. The eggs are stuffed, topped with breadcrumbs, and broiled until golden brown. Cream cheese adds richness and creamy texture to these deviled eggs. A dash of Dijon mustard and vinegar add the tanginess. 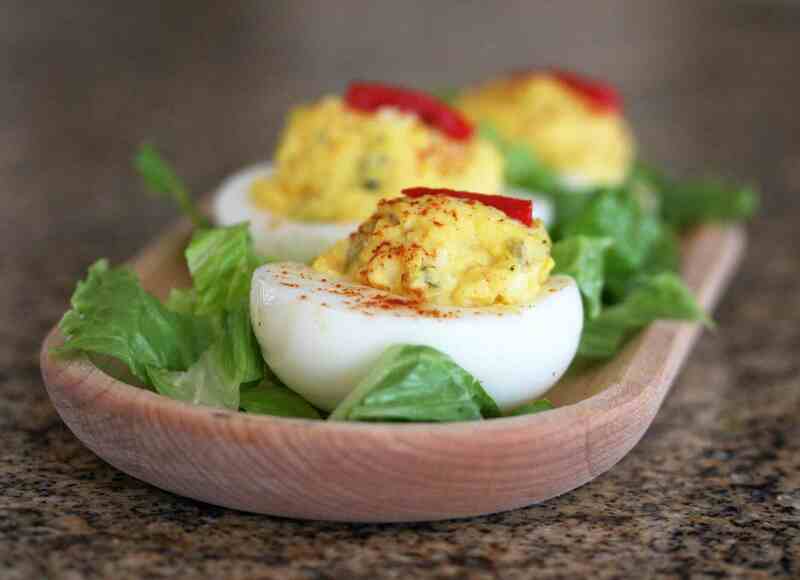 Your guests will love these yummy deviled eggs! A bit of honey mustard adds a subtle sweetness to these deviled eggs. These tasty snacks will go fast! The filling for these elegant deviled eggs includes a balance of spices and seasonings, along with some mayonnaise and lemon juice. Garnish the eggs with chopped fresh chives and paprika.